After studying chemistry at Arkansas Tech, I graduated from the University of Tennessee - Memphis with my dental degree. I am an active member of the American Dental Association, The Academy of General Dentistry, The Academy of Gp Orthodontics, and The International Association of Orthodontics. Our office uses the fusion of modern technology and superior skill to create today’s finest cosmetic and restorative dentistry. We want you to be confident with your smile and in our ability to create a beautiful smile for you! I appreciate the time you have taken to view our website to learn more about myself, my team, and the services that we offer at my dental practice. 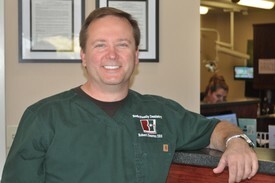 I look forward to the opportunity to take care of the dental needs of you and your family.